Chubby Gorilla is one of the leading vape supply retailers on the market and is the trusted source for thousands of vape-related products by people all across the globe. Because of our eminence within the community and devotion to selling top-quality products, we are proud to feature a wide variety of Chubby Gorilla vape dripper bottles on our website. 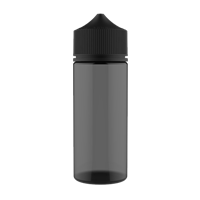 These Chubby Gorilla 30 mL bottles are unlike any other on the market and boast a childproof cap, a slim, travel-friendly design and an easy-pour, narrow drip tip for spill-free dispensing. Our bottles are also extremely durable and are able to withstand a variety of harsh conditions. Need another reason to buy? Our selection of vape unicorn bottles are all listed at low, competitive prices, making them some of the best-valued products both online and in store. Browse our extensive inventory of Chubby Gorilla E-Juice bottles today and see why DIY Flavours is many people's go-to online retailer for all their vaping needs!